Washington, D.C. — The U.S. Census Bureau and the U.S. Department of Housing and Urban Development jointly announced new residential construction statistics for April 2018. 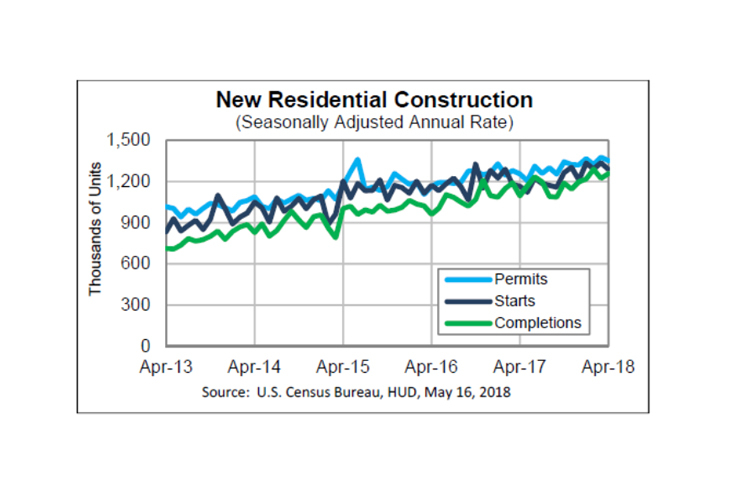 Privately owned housing units authorized by building permits in April were at a seasonally adjusted annual rate of 1,352,000. This is 1.8 percent (±1.3 percent) below the revised March rate of 1,377,000, but is 7.7 percent (±0.9 percent) above the April 2017 rate of 1,255,000. Single-family authorizations in April were at a rate of 859,000; this is 0.9 percent (±1.4 percent) above the revised March figure of 851,000. Authorizations of units in buildings with five units or more were at a rate of 450,000 in April. Privately-owned housing starts in April were at a seasonally adjusted annual rate of 1,287,000. This is 3.7 percent (±11.4 percent) below the revised March estimate of 1,336,000, but is 10.5 percent (±9.7 percent) above the April 2017 rate of 1,165,000. Single-family housing starts in April were at a rate of 894,000; this is 0.1 percent (±11.8 percent) above the revised March figure of 893,000. The April rate for units in buildings with five units or more was 374,000. Privately owned housing completions in April were at a seasonally adjusted annual rate of 1,257,000. This is 2.8 percent (±10.1 percent) above the revised March estimate of 1,223,000 and is 14.8 percent (±10.5 percent) above the April 2017 rate of 1,095,000. Single-family housing completions in April were at a rate of 820,000; this is 4.0 percent (±9.2 percent) below the revised March rate of 854,000. The April rate for units in buildings with five units or more was 425,000. Commenting on the report, Scott Volling, principal, PwC, said, “Housing starts for April came in at 1,287,000, 2.8 percent below the consensus number of 1,324,000. This is also 3.7 percent below last month’s result of 1,336,000, which was revised upward by 17,000 units. Permits came in at 1,352,000, very near the consensus number of 1,354,000. Positively, permits in March were revised upward by 23,000 to 1,377,000, a 10+ year high. Also positive in the March revisions is an increase in the single-family number of 26,000 units, to 893,000. As we typically see with the volatile multi-family number, March’s strong results were revised downward by 11,000 units to 428,000, while April saw a further reduction of 12.6 percent to 374,000. “After a strong March that was largely driven by an increase in multi-family starts, the consensus number this month reflects expectations that single-family starts would rebound and highlight the pent-up demand that continues to exist in the market,” Volling said. “However, with single-family starts coming in below 900,000 and aggregate starts below 1,300,000, and despite double-digit percentage improvements over last year’s results, this month’s numbers are a bit disappointing. While the unexpected spring snow in the Midwest and northeast may have temporarily impacted results in those regions, the almost 4 percent drop in starts over last month may be more reflective of the labor challenges that continue to constrain residential construction.